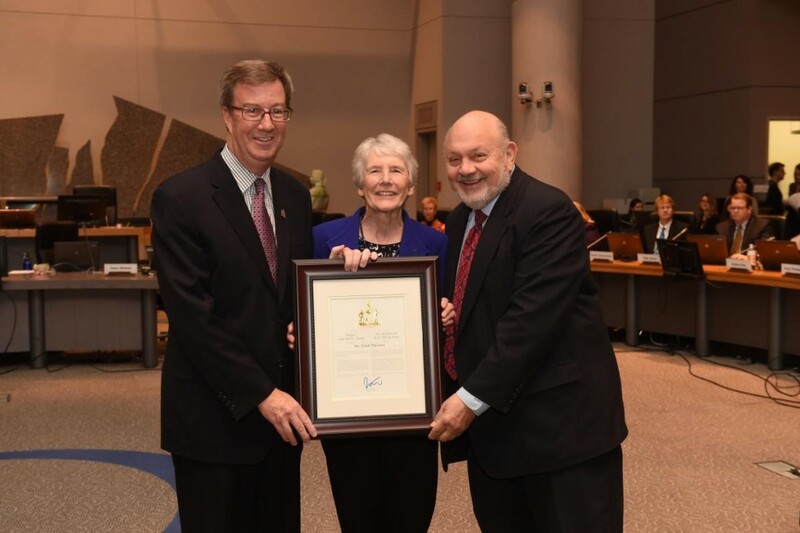 Mayor Jim Watson and Ward Councillor Peter Clark presented the Mayor’s City Builder Award to Carol Burrows today for her five decades of advocacy for seniors’ rights and continuing volunteer work to improve the quality of life of Ottawa’s seniors and older adults. Mrs. Burrows, at 78, is not spending her upper years in warmer climates and leisure pursuits. Rather, she continues to work with many Ottawa organizations that help and advocate for seniors. Her personal focus is on affordable supportive housing for seniors, particularly women and those who have the lowest incomes or are homeless. She started working for a better quality of life for seniors in the 1970s, when she was in her 20s. She was managing a Lighthouse program at a local school, where she arranged an evening program to help teach people how to care for their elderly parents. She also developed a pilot project that encouraged grade six students to spend at least one afternoon a week with seniors at a nearby nursing home. The pilot was a huge success and became permanent.